Pumping water through a pipe solves the need to provide water in every house. By turning on faucets, we retrieve water at home without needing to carry it from a reservoir with buckets. However, driving water through a pipe requires external pressure; such pressure increases linearly with pipe length. Longer pipes need to be more rigid for sustaining proportionally-increased pressure, preventing pipes from exploding. Hence, transporting fluids through pipes has been a challenging problem for physics as well as engineering communities. To overcome such a problem, Postdoctoral Associate Kun-Ta Wu and colleagues from the Dogic and Fraden labs, and Brandeis MRSEC doped water with 0.1% v/v active matter. The active matter mainly consisted of kinesin-driven microtubules. These microtubules were extracted from cow brain tissues. In cells, microtubules play an important role in cell activity, such as cell division and nutrient transport. The activity originates from kinesin molecular motors walking along microtubules. In cargo transport, microtubules are like rail tracks; kinesin motors are like trains. When these tracks and trains are doped in water, their motion drives surrounding fluids, generating vortices. The vortices only circulate locally; there is no global net flow. Figure: Increasing the height of the annulus induces a transition from locally turbulent to globally coherent flows of a confined active isotropic fluid. The left and right half-plane of each annulus illustrate the instantaneous and time-averaged flow and vorticity map of the self-organized flows. The transition to coherent flows is an intrinsically 3D phenomenon that is controlled by the aspect ratio of the channel cross section and vanishes for channels that are either too shallow or too thin. Adapted from Wu et al. Science 355, eaal1979 (2017). Biological material is constantly consuming energy to make things move, organize information such as DNA, or divide cells for reproduction; but building a fundamental theory which encompasses all of the features of biological matter is no easy task. The burgeoning field of active matter aims to understand these complex biological phenomena through physics. Active matter research has seen rapid growth over the last decade, but linking existing active matter theories with experimental tests has not been possible until recently. An explosion of biologically based and synthetic experimental systems as well as more detailed theories have arrived in recent years, and some of these foundational experiments have been conducted here at Brandeis University. Recently, a Nature News Feature (The Physics of Life) has highlighted work from Zvonimir Dogic’s lab in an article about the field of active matter and the physics which endeavors to understand biology. Forbes India recently named Brandeis post-doc alumna Prerna Sharma as one of India’s “30 under 30”. 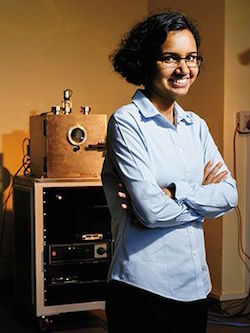 Sharma, who worked in Prof. Zvonimir Dogic’s group in Physics, is currently an Assistant Professor at the Indian Institute of Science (IISc), Bangalore. The ‘Insight Awards‘ is a video contest showcasing research imagery from the physical and life sciences which utilize Andor technology to capture data. This year, the Dogic Lab submitted a research video to the competition and garnered first prize in the Physical Sciences division for their video of Oscillating Microtubule Bundles. Microtubules are a bio-polymer composed of the protein tubulin and are used extensively in the cell for cellular division, cell motility, and transportation of cargo within the cell. Here, we investigate the material properties of mixtures of microtubules, a depletion agent, and the molecular motor Kinesin. The microtubules, driven by Kinesin motors, spontaneously organize into bundles of microtubules that oscillate in a manner reminiscent of flagella and cilia found in biology. This engineered system will allow us to studying systems of self-propelled and self-organized matter that exist far from equilibrium in the field known as Active Matter. We use standard fluorescent microscopy to image labeled microtubules in a thin, flow cell microscope chamber. An Andor Clara camera was used in conjunction with a Nikon Ti Eclipse microscope to capture this video. Video and Entry by Stephen DeCamp. For this, and more videos from the Dogic Lab, visit their YouTube page or their website at Brandeis University. Life is on the move! Motion is ubiquitous in biology. From the gargantuan steps of an elephant to the tiniest single celled amoeba, movement in biology is a complex phenomenon that originates at the cellular level and involves the organization and regulation of thousands of proteins. These proteins do everything from mixing the cytoplasm to driving cell motility and cell division. Deciphering the origins of motion is no easy feat and scientists have been studying such complex behavior for quite some time. With biology as an inspiration, studying these complex behaviors provides insight into engineering principals which will allow researchers to develop an entirely new category of far-from-equilibrium materials that spontaneously move, flow or swim. In a recent report in the journal Nature, a team of researchers from Brandeis University consisting of Tim Sanchez, Daniel T. N. Chen, Stephen J. DeCamp, Michael Heymann, and Zvonimir Dogic have constructed a minimal experimental system for studying far-from-equilibrium materials. This system demonstrates the assembly of a simple mixture of proteins that results in a hierarchy of phenomena. This hierarchy begins with extending bundles of bio-filaments, produces networks that mix themselves, and finally culminates in active liquid crystals that impart self-motility to large emulsion droplets. Their system consists of three basic components: 1) microtubule filaments, 2) kinesin motor proteins which exert forces between microtubule filaments, and 3) a depletion agent which bundles microtubule filaments together. When put together under well-defined conditions, these components form bundled active networks (BANs) that exhibit large-scale spontaneous motion driven by internally generated active stresses. These motions, in turn, drive coherent fluid flows. These features bear a striking resemblance to a biological process called cytoplasmic streaming, in which the cellular cytoskeleton spontaneously mixes its content. Additionally, the system has great potential for testing active matter theories because the researchers can precisely tune the relevant system parameters, such as ATP and protein concentration. The researchers also demonstrate the utility of this biologically-inspired synthetic system by studying materials science topics that have no direct biological analog. Under dense confinement to an oil-water interface, microtubule bundles undergo a spontaneous transition to an aligned state. Soft matter physics describes such materials as liquid crystals, which are the materials used to make liquid crystal displays (LCDs). These active liquid crystals show a rich variety of dynamical behavior that is totally inaccessible to their equilibrium analogs and opens an avenue for studying an entirely new class of materials with highly desirable properties. Lastly, inspired by streaming flows that occur in cells, the researchers encapsulate the bundled active networks into spherical emulsion droplets. Within the droplet, microtubules again formed a self-organized nematic liquid crystal at the oil-water interface. When the droplets were partially squished between glass plates, the streaming flows generated by the dynamic liquid crystals lead to the emergence of spontaneous self-motility. This research constitutes several important advances in the studies of the cytoskeleton, non-equilibrium statistical mechanics, soft-condensed matter, active matter, and the hydrodynamics of fluid mixing. The researchers have demonstrated the use of biological materials to produce biomimetic functions ranging from self-motility to spontaneous fluid flows using fundamentally new mechanisms. Additionally, the experimental system of bundled active microtubules is poised to be a model for exploring the physics of gels, liquid crystals, and emulsions under far-from-equilibrium conditions. To see more videos from the Dogic lab at Brandeis University, check out their YouTube page.